Hi everyone! Today I’ll be looking at the universally hated, part-time champion known as “The Beast” Brock Lesnar. It’s the same old story: Challenger wants Brock. Heyman puts them over, before sharing “spoilers”. Brock grins, laughs at Paul .. then leaves. The challenger runs his mouth, wanting to bring the title back to Raw. Lesnar sits at home without a care in the world, enjoying his family’s company. Almost every week, the challenger complains “It’s not fair! Why does he get preferential treatment?” A few weeks later, a big deal is made of Lesnar emerging. He smiles after throwing his challenger down with the F-5. At the PPV, following a valiant effort from the challenger .. German Suplex, German Suplex, German Suplex, F-5! Lesnar retains. And all hope is lost, as The Beast returns to his slumber. When kayfabe died, the best kind of heat shut up shop as well. Remember when The Dudleys caused riots in ECW? Remember how fans loved to hate Ric Flair (and still do)? They bought in to what they were selling, and with hardly any limits, heels had the freedom to do almost anything for their rewards. They gave us the passion to support those who never gave up hope in the face of evil. On the other hand though, WWE has been setting limits since the mid-2000s, and the world of political correctness exacerbated this further (micro-managing promos etc.). How do we cheer a John Cena when he’s got no equal nemesis? How do we support a Roman Reigns when there’s no one who matches up? Where did all the villainy go? It’s still there, but WWE’s had to adapt to more subtle ways of getting heat. They tap in to real-life situations, and often use other talent to spread their “outrage” via interviews and social media. In Brock Lesnar’s case, the part-time contract ensured he’d be their biggest heel so long as they’re willing. No chance of turning face though, because the WWE Universe would continue sharing their frustration over his (lack of) booking. Since returning under his part-time deal seven years ago, the contract situation has continued to be talked about among WWE fans and superstars. After ending The Undertaker’s streak, Brock was built up to be his successor as the undefeatable champion. He’s like an end boss of a game which is so difficult, you’ll only beat it once every twenty, thirty, fifty attempts. At this point, his retaining is so inevitable it gets under people’s skin. Some would be happy to see the back of him. A couple of years ago in an interview on the “Stone Cold” podcast, Paul Heyman talked to Steve Austin about Lesnar’s part-time status. Might be able dig it out for another article down the road, but it was agreed it made sense, not just for what Brock wants, but also for what WWE needs to keep his character fresh. Over saturating him, much like what happened near the end of his first run, was something they needed to avoid. Also, keeping him part-time means he’s less prone to serious injuries, helping his career in the long-term. Speaking of Heyman, he’s always been a valuable asset. “The Next Big Thing” suffered tremendously after ditching Heyman to be a standalone babyface champion in late-2002 (in fact it was the other way around, but it’s not important). WWE learned from their mistakes, and decided Paul must be by his side after his return in 2012. Even if Lesnar treats him like trash, Heyman will endure his wrath without question. Why? Because he knows, and everyone else knows .. that the Heyman character needs to be at Lesnar’s side more than Lesnar needs him. In reality, they are close friends who are bound to be remembered as an inseparable TV duo. Brock does his talking in the ring. Although, when he does get vocal, he gets your attention due to how rare it is. If the challenger isn’t worthy? They get laughed at, and it’s the same for the WWE Universe. Brock is so good at showing he doesn’t care for any criticism. The Universal Championship was introduced to “represent the WWE Universe” .. but he is the antithesis of the title’s purpose. He is the anti-champion nobody wants. We don’t care who beats him .. we just want him out of our lives. As much as it feels like Vince doesn’t know what he’s doing .. and as much as it seems like Brock has him bent over backwards (with his contract), this negative situation has been encouraged for heat. Brock doesn’t have “special privileges” Vince can’t control, and he certainly doesn’t have the last say on anything. But that’s what WWE wants you to believe. They want you to believe Lesnar is so powerful, even Vince McMahon can’t stop him. To this day, Brock remains under the best tutelage. The Undertaker taught Brock everything early in his career, and was putting him over in Hell in a Cell long before they ever met at Wrestlemania. Lesnar’s been working everyone with a character so devoid of empathy, we can almost believe he’s like that when the cameras are off. I’m sure Lesnar does care somewhat about WWE and its fans. He could make money anywhere .. he could fight, do movies, other projects, or easily retire on what he’s made. Yet he chooses to wrestle? Does he sound like someone who isn’t enjoying it? Not unless he needs the money I guess; although it could also be a matter of the light schedule being convenient at this point. The Beast is still an attraction, and so long as he draws .. anyone who challenges him is better for it. Each year we hear rumors that Lesnar will certainly “leave WWE after Wrestlemania”. There’s always something giving us a smidgen of hope .. but it’s often exaggerated. It’s not a matter of if Lesnar retains anymore, it’s a matter of when. And this year .. we see Seth Rollins challenging, yet I cannot bring myself to hope. He’s the only credible opponent Brock has not faced one-on-one, but it does not make me believe anything more than the inevitable will happen. It would be truly shocking if he did pull off the upset (I’d jump out of my seat! Like when he cashed in..), but we know it would only happen if Lesnar is on the way out. I cannot remember another heel champion being as dominant as Brock Lesnar has. He had a small blip with Goldberg, and of course, there was Roman Reigns taking the title at Wrestlemania (helped by Braun Strowman). But as soon as Roman needed to vacate, WWE wasted no time relying on him again. And they’ll keep doing so, til the “Big Dog” is ready to challenge once more. Only when Roman Reigns (or someone else) is ready to lead WWE in to the next generation, will The Beast step aside. I’m not a big Lesnar fan, but the writing is on the wall. If Rollins does somehow come out of Wrestlemania as champion, it’ll be another massive moment I’m sure everyone will enjoy celebrating. What do you think? 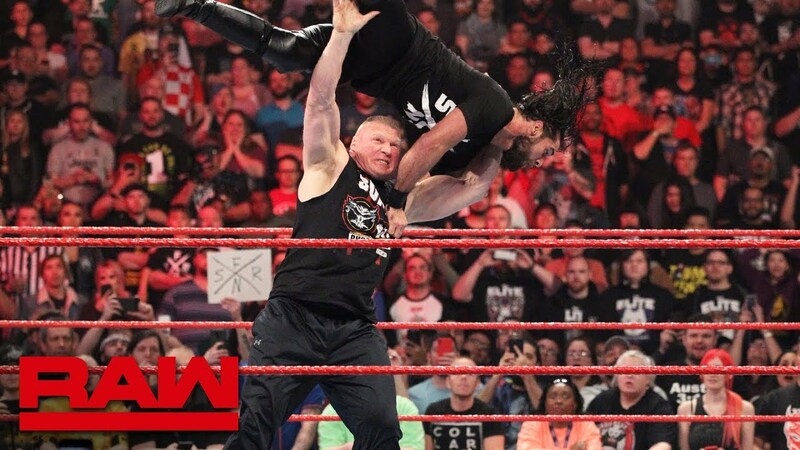 Is Lesnar the most dominant heel champion in WWE history? Will he keep the title hostage post-Wrestlemania? Are we destined for more of the same? Because yeah, so long as Brock enjoys playing the game, we can’t argue with WWE for making him the benchmark for future generations. His reign of terror will end someday, and it will never be forgotten. The Universal title may be a joke for now, but it may finally live up to its potential when it returns home to Monday Night Raw full-time. Thanks for reading!